If you’re like most people, you get your home internet from a company that used to sell mostly phone or internet service. If you’re in AT&T territory, hopefully you’re thinking of bundling AT&T internet with DIRECTV. Give us a call at 877.312.4547 and we can help you with that. OK, sorry, mandatory sales job over, back to the article. If your cable or phone company supplies your internet, they may also supply your router. Some companies let you use any router at all and just make you use their cable modem to connect it. On the other hand, some companies make you use their combination router and modem. There’s just no other option. And sad to say, these routers are almost always old and slow and don’t support the latest networking standards. Luckily there’s an easy answer. All you need to do is add a wireless access point. 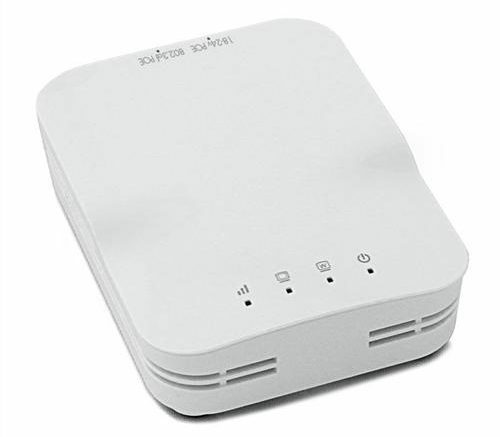 An access point does everything the router does: It gives you great wireless networking and you can decide how much power you want and how much money you spend. It connects via ethernet cable to your router. If you want, you can turn off the wireless in your router and set up the new access point to use the same SSID (network name) and passphrase. Your devices will automatically connect to the new access point. Access points like the ones from Open Mesh will work together, automatically adjusting themselves so multiple access points don’t compete and blanketing your home with great Wi-Fi. All you need is a wired network connection to each access point. An access point is easy to install and once you have it installed, it usually doesn’t take any more effort. Simply connect it to your router and run the software that comes with it (or download it from the manufacturer’s web site.) In most cases you only need to run one cable, because they use a technology called “Power over Ethernet” that lets you power the access point over unused wires in the network cable. That makes it easy to run cable to faraway locations in the home. Let’s face it, good Wi-Fi is a necessity today, especially if you consume a lot of data. Until cell companies come up with unlimited data plans, your streaming should all be over Wi-Fi. Otherwise you’ll rack up some pretty impressive bills. Maybe in the future all home networking will be over LTE anyway (I actually think this is coming fairly soon) but in the meantime you’ll need good, solid home networking to do pretty much everything you want to do. Don’t worry if you’re not confident… the signal professionals at Solid Signal can help you pick out the perfect access point. If you can’t run cable, they can also suggest a wireless repeater, which gets your Wi-Fi signal wirelessly and creates a new network for your use. It’s not as convenient in a day-to-day situation, but it’s a lot easier and less expensive to set up. Get started now on the road to great wireless networking everywhere in your home (hint: these things work great in businesses too) by calling Solid Signal at 877.312.4547. You don’t need to struggle with slow speeds any more!